I hacked my way onto Mandy's blog, Harper's Happenings, today. You can check out all the awesomeness there. Rolling Stone Magazine said it's the the best post they've seen this year. It's also up for a Pulitzer or two. you have yourself a brand new fan from mandy's site! LOL i've been following both of yalls blogs for a while and when I saw that post on the haps, i about died of laughter. i also like how when you click the best post link, when it's all said and done, lyrics to tupac songs come up. well done, kenny. Way to stand up for the man-folk. Your Pumas were sweet, but the trike really sealed the deal for me. 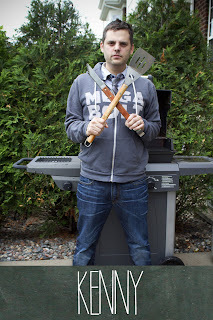 I have to admit though that I found the photos with the grilling implements to be vaguely reminiscent of the Texas Chainsaw Massacre, which was disturbing. Overall a quality post - kudos on your hack. Thanks Lauren and other Lauren. Two Cats Lauren I wasn't going for a Texas Chainsaw thing but I'm originally from Ohio and a lot of serial killers were born or spent time there. We had a blast on this photo-shoot. I loved taking photos with your camera. HOwever, I wasnt quite sure in what context this was going to be used. So I read the post and cried from laughter. You are quite a hoot! PS Harpers Happenings is an aweome blog and I commend her for putting up with your shannangins.